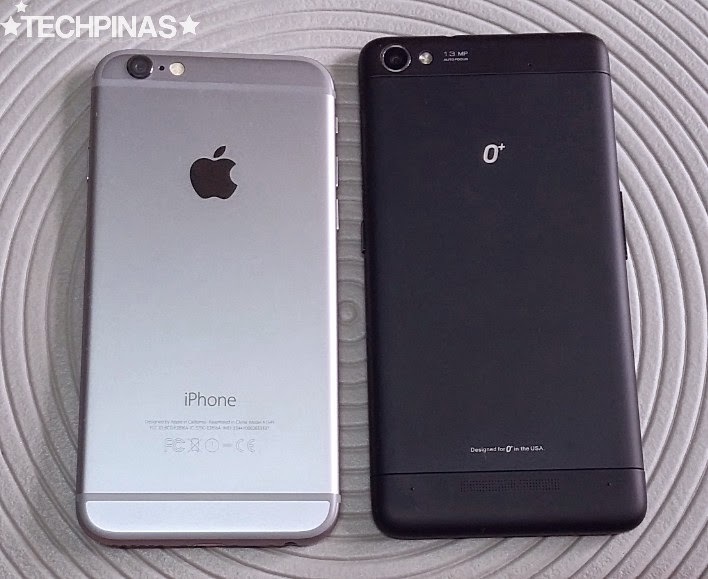 I was playing with my Apple iPhone 6 and O+ Air smartphones while having my 'merienda' yesterday afternoon when my younger brother (Val of BallersPinas) - who was sitting beside me - blurted out, "They look alike!" So I placed the two handsets - face up, side by side each other - on the place mat in front of me and tried to confirm what my bro pointed out by looking for some design similarities. Side note: O+ Air hit store shelves across the Philippines last June 2014 while the iPhone 6 was released in key markets globally just last month, September 2014. 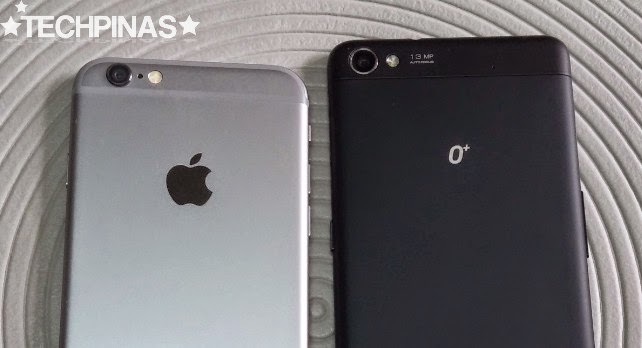 Well, for one, the two phones have the same 'square with rounded sides' footprint with O+ Air looking like a slightly taller version of Apple's flagship handset. The iPhone 6 has dimensions (height x width) of 138.1 x 67 mm while the other American company's top-of-the-line release measures 143 x 70 mm. 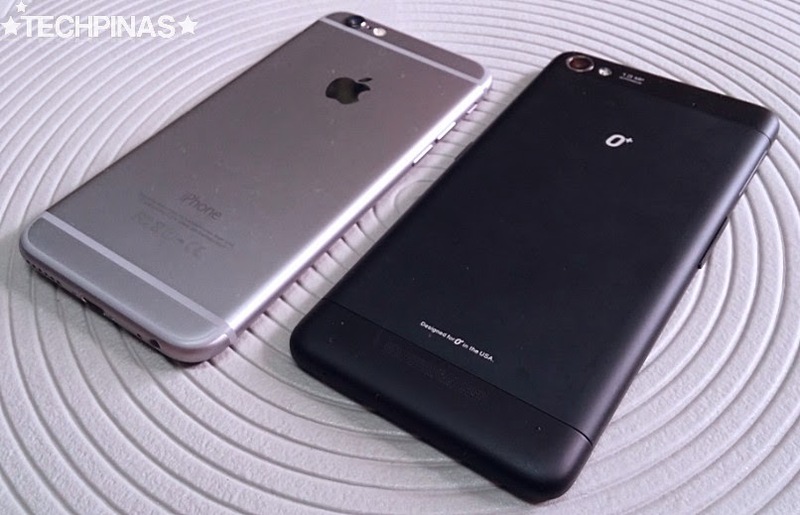 Flipping the two devices over, we see more design parallels. Both have a real metal shell albeit Apple iPhone 6 has these white bands while the O+ Air has plastic caps to improve signal reception. Even the position of the camera module with LED flash is identical on this duo. I have to note, though, that the one on O+ Air doesn't protrude so it's not much of an 'impact point' that's prone to dents and scratches. Finally, these two share an ultra-thin and super lightweight build and construction. 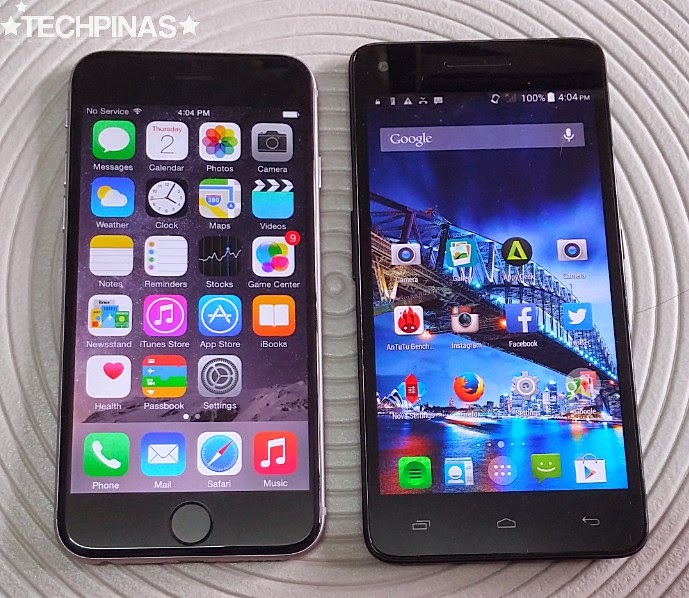 Apple iPhone 6 only measures 6.9 millimeters at its thickest point while O+ Air is even thinner at 6.8 millimeters. In terms of weight, the O+ Air - totally worthy of its name - is way lighter at only 115 grams while Apple's flagship weighs 129 grams. And that's just about it. It's clearly a mixed bag in terms of specs. Android 4.4 KitKat powered O+ Air has a bigger display, higher resolution front and back cameras, has expandable storage, comes with Dual SIM Dual Standby capability, and is equipped with a larger battery pack. On the other hand, Apple iPhone 6 running iOS 8 has a more powerful processor, more connectivity support including LTE and NFC, and has better camera sensors. Obviously, when we compare these devices, we can't help but also revisit that 'Google vs. Apple' rivalry in the mobile arena and pit Android and iOS - yet again - against each other. Which platform is better? For me, that depends on the user. 1. More customizable when it comes to themes, launchers, and even keyboards. 2. Has better social networking and third-party app integration. I'm sure you can add more to these lists so feel free to leave your comments below. To be honest, though, I'm starting to feel that this whole iOS vs. Android battle is becoming moot and academic as almost all popular or key apps and games are now available on the two platform unlike way back in 2010 until 2011. 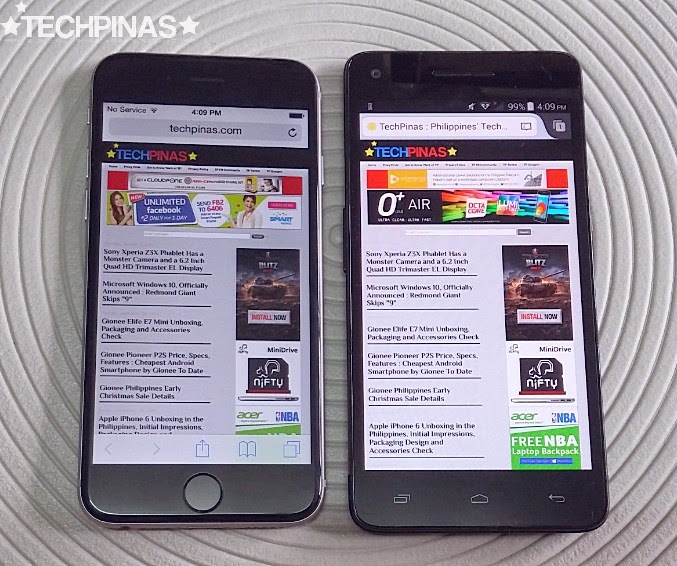 Apple iPhone 6's 4.7 inch HD Retina Display vs. O+ Air's 5 inch Lumi Display at 0% Brightness. 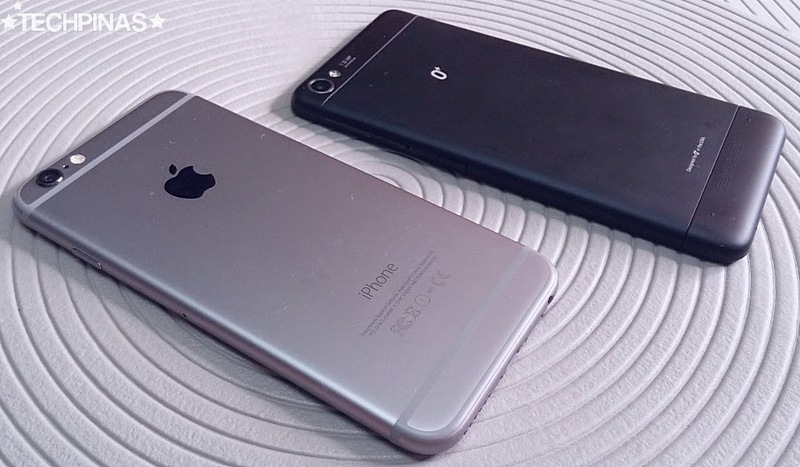 To wrap this up, let me give you my quick description of these two stunning flagship models. O+ Air: Currently priced at only Php 13,995, O+ Air is the very first Octa Core device in the Philippines to run Android 4.4 KitKat right out of the box and is inarguably the lightest 5-inch smartphone in the world today. Weighing just 115 grams, this handset features a number of unique innovations from the American company including the new Lumi display technology, which combines the wide color gamut and brightness of SuperAMOLED with the 'easy on the eyes' readability and energy-efficiency of ePaper. It also comes with O+'s patented Air Shuffle technology that allows you to take photos simply by waving your hand in front of the phone's display and the new O+ Air Share cloud storage service, which lets you quickly share photos, videos, and other content with fellow O+ phone users. 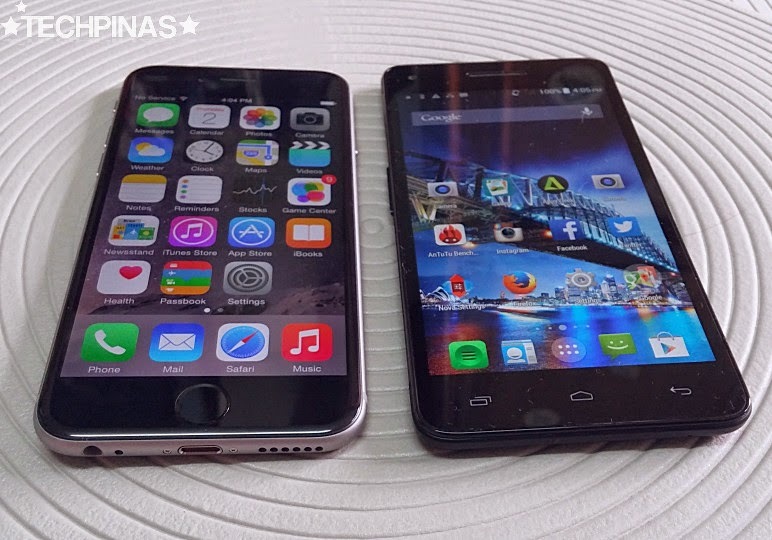 Apple iPhone 6: The natural follow-up to the widely popular and very successful Apple iPhone 5S, the Apple iPhone 6 isn’t simply bigger -- it’s also better in every way. Larger, yet dramatically thinner. More powerful, but remarkably power efficient. With a smooth metal surface that seamlessly curves to meet its new 4.7-inch Retina HD display. It’s one continuous form where hardware and software function in perfect unison, creating a new generation of smartphone by the American company that’s better by any measure. It is equipped with a powerful Apple A8 chipset and features an enhanced 8 MegaPixel main camera with Focus Pixels and f/2,2 aperture for an even better low-light performance.